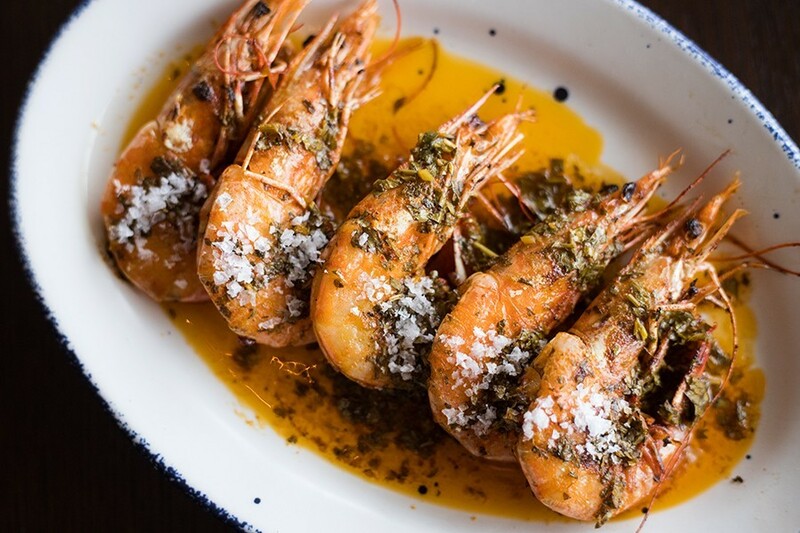 ”Prawns a la Plancha” are served head-on and dressed with garlic, smoked paprika and lemon. 999 North Second Street, 314-881-5759. Mon.-Sat. 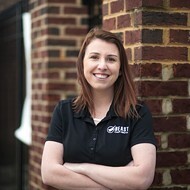 6:30-10:45 a.m., 11 a.m.-2:30 p.m. and 5-10 p.m.; Sun. 6:30-10:45 a.m., 11 a.m.-2:30 p.m. and 5-9 p.m. It was September 2005, the night chef Gerard Craft opened Niche — perhaps the biggest night of his professional life. And of course, Dia was there. She was always there. Even before Craft was born, Cecelia "Dia" Assuncao had endeared herself to the Craft family as much more than a nanny. "Second mother" is what Craft calls her, and she certainly filled that role. In fact, she was the only one who could get the young Craft to eat anything besides buttered noodles, and she showed her love by plumping him up with feijoada beans and rice, flan and rice pudding. This time, however, it was Craft's turn to feed Dia, and he knew just the dish to send her way. 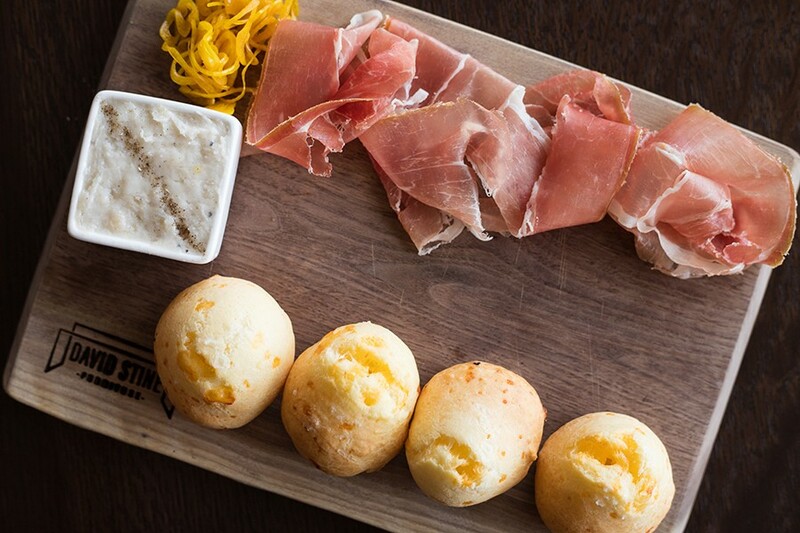 The tapioca-based cheese poufs that are a staple in her native Brazil may be called pao de queijo, but to Craft, they've always been "Dia's Cheese Bread." Having them on the menu at his debut restaurant meant much more than providing a wonderful item for his guests. It was a way to show Dia how much she had inspired him, that he had been paying attention all those years, that she'd helped make him the chef he'd become. He didn't need her to tell him he'd nailed it; when he looked over, he got all the confirmation he needed. ”Dia’s Cheese Bread,” with country ham, smoked lardo and pickled vegetables, is named after the woman who inspired the restaurant. It's not a stretch to say that Craft might not have become a nationally recognized, James Beard Award-winning chef if not for Dia. Her culinary influence was omnipresent in his life. Craft calls her the best cook he's ever met, and he credits Dia with instilling in him a love of, and curiosity about, food, searing into his memory the flavors he's drawn upon throughout his career. Though Dia's influence always provided a backbeat to Craft's cooking, it moved to the foreground this spring when he was approached by the Four Seasons about opening a restaurant inside its St. Louis hotel. Craft decided on a steakhouse concept that he thought made sense for hotel diners. 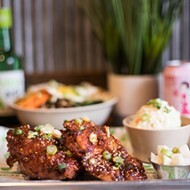 He did not want it to be just any steakhouse, however, and he gravitated toward the idea of a global barbecue spot centered around wood-fired cooking. As the menu began to take shape, Craft found himself being flooded with memories of Dia's cooking. Her cheese bread had to be there, he thought. So did her coxinha, or Brazilian cheesy chicken croquettes. The further he went down the rabbit hole, the more he realized he was building an entire restaurant around her food. The bar at Cinder House was recently recognized as the most beautiful in Missouri by Architectural Digest. That restaurant, Cinder House, opened in August, replacing the fine-dining Italian spot Cielo. Aesthetically, the revamp is nothing short of stunning. Cielo was pretty; Cinder House is drop-dead gorgeous. 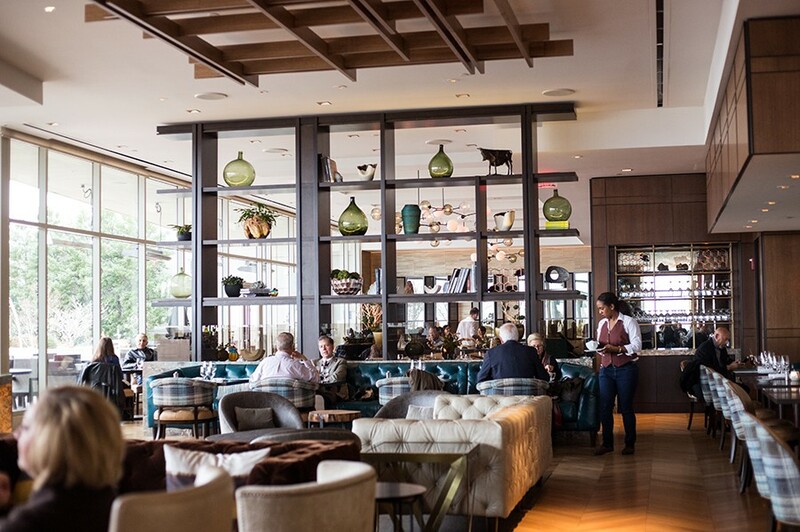 Divided into separate restaurant and lounge spaces, it's outfitted in leather and velvet in hues of tan and sapphire blue, turquoise and earth-tone marble and craggy, driftwood-style sculptures. Architectural Digest recently named it the most beautiful bar in Missouri. It could be a plain white box, however, and earn that distinction based on the view alone: Occupying the hotel's eighth floor, Cinder House has a southern-facing, bird's eye view of the Arch. It's one of the best views in the city. When the sun goes down, light sparkles off the windows. As you look out across the outdoor patio's glittering fire and water features, you feel like you are in a diamond-encrusted dream. Such a setting requires food that honors its grandeur, and Cinder House delivers. 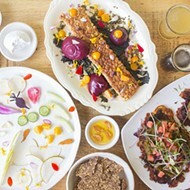 Craft, together with his executive sous chef Michael Fricker, has created a menu of dazzling South American-style dishes that use Dia's cooking as a jumping-off point. Prawns, for instance, evoke the grilled sardines she regularly cooked for the Craft family. Here, with the head-on shellfish substituted for sardines, tender prawns soak in deliciously bitter wood smoke. It infuses the accompanying garlic, chile and smoked paprika butter, creating a warm, subtly spicy seafood jus. The dish is simple, but its flawless execution exemplifies Fricker's prowess with seafood. Carne de Onca, Brazil's version of beef tartare, is luxuriously creamy, especially when the egg-yolk garnish fully mixes with the finely minced meat. The dish is decadent, but its richness is cut with chiles, paprika and herbs; there's almost a licorice, perfumey note to the flavor. The heat from the chiles is not evident up front, but their warmth lingers at the back of the throat. The appetizer perfectly fuses Craft's South American vision with the luxury of the Four Seasons. The hen-of-the-woods mushroom appetizer is every bit as meaty as the beef tartare. The large, ruffle-shaped fungi are expertly cooked in butter that's seasoned with chorizo spices, softening their texture to the point that they are silken. The show-stopper of the plate, however, is the polenta. Each mushroom is placed atop a mound of the cornmeal dish that is shockingly smooth and creamy. It soaks up the mushroom jus and chorizo butter like gravy. Feijoada, a traditional Brazilian dish, brims with beans, rice, oranges and various cuts of beef and pork. One taste of "Dia's Cheese Bread" makes you understand why she was such an inspiration. The delicate, cheese-studded spheres melt in the mouth before you have a chance to chew. The bread is a masterpiece on its own, but Craft pairs it with country ham that is shaved prosciutto-thin and a ramekin of salt-sprinkled lardo. Together, they infuse the light cheese puffs with salt and porky flavor. It's no wonder this dish has followed him throughout his career. Entrees are one masterpiece after another. "Fall Squash Risotto" may not be a South American dish, but its flavors blend well with the rest of the menu. The texture is flawless — creamy, yet the grains retain their al dente mouthfeel. Tomatoes give the risotto a gentle tang, an excellent canvas for the hunks of charred butternut squash and pepitas that pepper the plate. Trout, served skin-on, is remarkably fresh and well cooked. A saute of red-and-green cabbage, capers and garlic cloves top the fish, and rich brown butter gilds its delicate flesh. This dish again allows Fricker, who grew up in coastal New Jersey, to show his skill in preparing fish. 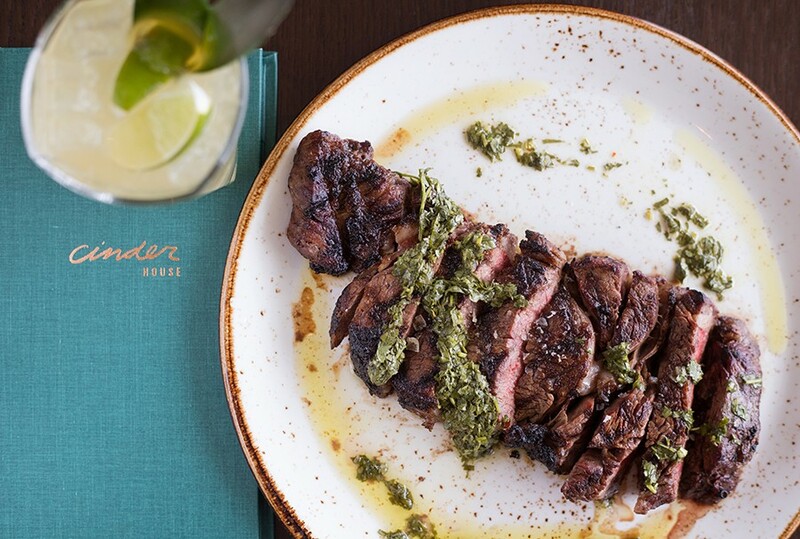 Cinder House utilizes a wood-fired grill for its excellent meat offerings, including a sixteen-ounce prime rib-eye. Cinder House's wood-fired grill inspires the restaurant's à la carte meat offerings. A bavette sirloin features the flap of the sirloin typically used for fajitas. Simply seasoned with salt and pepper, it is cooked to a spot-on medium rare. 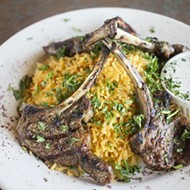 Lamb chops, also expertly grilled, are as large as baseballs and marbled with buttery fat. It mingles with the meat's juice to form its own sauce. You might be tempted, then, to skip the accompanying chimichurri, one of three sauces that are served with the grilled offerings, along with béarnaise and mole. Don't. The verdant sauce adds a refreshing complement to the decadent meat. Craft may not have wanted Cinder House to be a traditional steakhouse. However, the quality and skill of the grilled offerings are as good as those at any of the big-name steak restaurants in town. 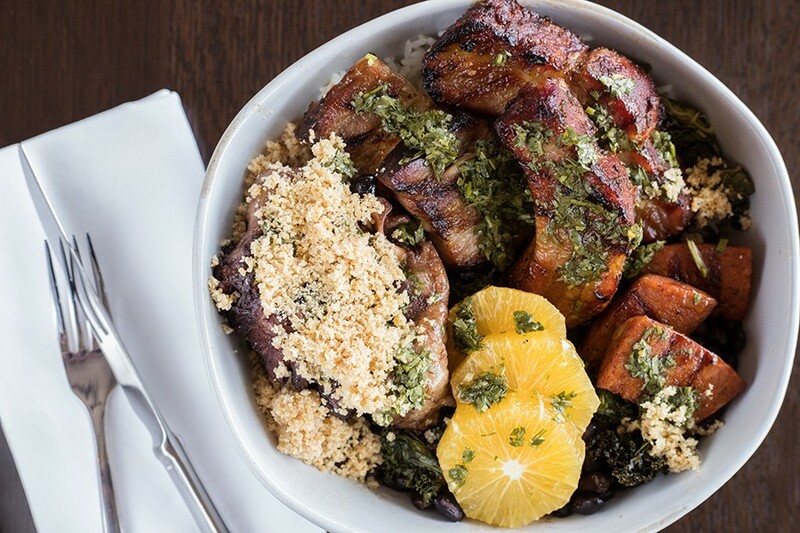 But Cinder House is even more thrilling when Craft leads with his heart on entrees like the feijoada, a five-star rendition of Brazil's national dish. The base, rice and black beans that have been cooked in pork and beef scraps, is exactly like Dia's — beautifully cooked between tender and snappy, and imbued with the meats' rich flavors. The rice and beans are topped with fat-laden brisket, sweet-glazed pork ribs, mild pork sausage and pork belly so creamy you could butter bread with it. This meat extravaganza could be overwhelming, but the components are tied together with bright chimicurri and citrus juice from the accompanying orange slices. It's a stunning celebration of a dish. Moqueca, a seafood stew, has a lobster-and-coconut-milk base that wraps you in a sun-kissed dream. The dish is filled with tender octopus, head-on prawns, snapper and fingerling potato confit. If bossa nova had a flavor, it would be this dish. You might be tempted to let the warm, rich flavor of the moqueca linger as your last taste of Cinder House, but dessert is not to be skipped. Churros are dusted with cinnamon and sugar, then fashioned into discs like cookies to serve as the bookends for a vanilla ice cream sandwich. The airy, doughnut-like pastries are warmed, tempering the ice cream into the consistency of custard. Executive sous chef Michael Fricker oversees the daily operations of Cinder House’s kitchen. Traditional flan is perfection of the form. The silken custard is slicked with a salted caramel that has the sweetness of brown sugar but the savory undertones of brown butter. Of course, it's perfect; it's how Dia did it. 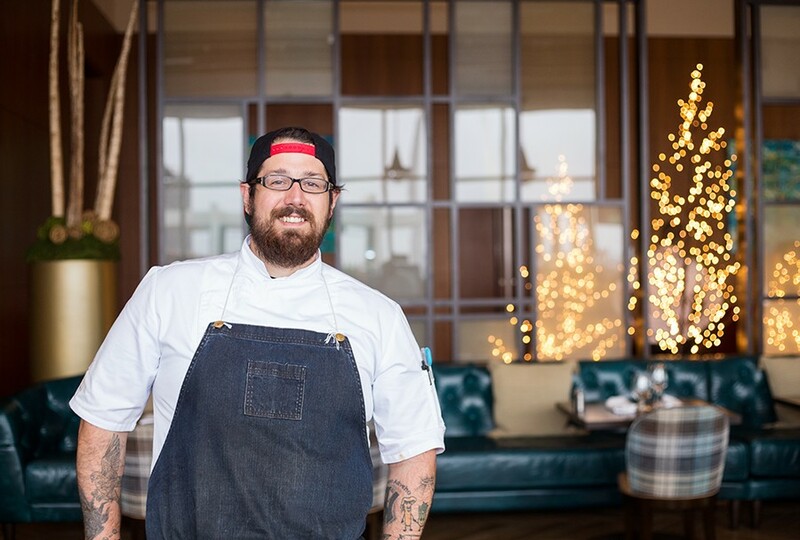 When Craft was just beginning his culinary career, he would often return to his native Washington, D.C., to cook with Dia. His wife would shadow the pair, writing down as much as possible to preserve Assuncao's recipes for posterity. She didn't get everything, however, and Dia is no longer around to give Craft advice. She passed away in 2009, living long enough to witness Craft grow into the chef she knew he could become but before she got the chance to see the restaurant she inspired. For some dishes, then, Craft has had to rely on his flavor memories. Yet in their recreation, he's nailed them. Just ask his dad, who, eating his son's flan for the first time, sat gob-smacked. "Oh my god," he exclaimed. "This is Dia's flan." Were Dia there to taste it, though, I can't help but imagine she wouldn't have had to say a word. The tears in her eyes would be more than enough.